RELIABLE AND REPEATABLE MEASUREMENTS THE FIRST TIME, EVERY TIME! The new and improved GRAS microphones secure efficient and reliable acoustic NVH testing. Explore the rugged and versatile GRAS 146AE standard microphone that applies to a variety of acoustic NVH applications and the highly specialized microphones designed for specific applications. Brake noise is a chassis-related noise and a big problem for car manufacturers. The noise is caused by friction-induced vibrations, which make the brake system radiate noise. This will in turn cause a lot of irritation and disturbance to the car owner and any person near the vehicle when it occurs. The brake noise can lead to poor results in surveys of customer satisfaction and high warranty costs. Therefore, the development of brake systems with minimum noise issues are highly prioritized in the automotive industry. Brake noise is a very complex problem and the research in this area is in continuous progress. The major challenge for brake noise measurements, is to be able to reproduce the numerous driving conditions that can cause the noise. For example, brake squeal during city traffic, or creep groan during parking. When this happens, during any of the thousands of brake applies, the noise must be recorded at the best possible quality. The SAE J2521 standard recommends a ½” free-field microphone with windshield. The microphone should be able to handle temperature variations and brake dust. For noise source identification, use intensity microphones or array microphones configured according to the relevant equipment needs. For test cell measurements, we recommend GRAS 146AE ½’’ CCP Free-field Microphone Set when testing brake noise on the dynamometer. For calibration, GRAS 42AG Multifunction Sound Calibrator, Class 1, is the ideal choice. The recommended microphone inside the vehicle is a ½“ free-field or random-incidence microphone as defined by company standards. For the wheelhouse measurements, there is a need for an extremely ruggedized measurement microphone with good performance. It should be able to endure long-term measurements at extremely tough conditions, diﬀerent environmental conditions and exposure to dust, water, salt and gravel. For wheelhouse measurements, we recommend GRAS 147EB CCP X-Rugged Microphone Set with its three layers of protection against water, dust and oil. 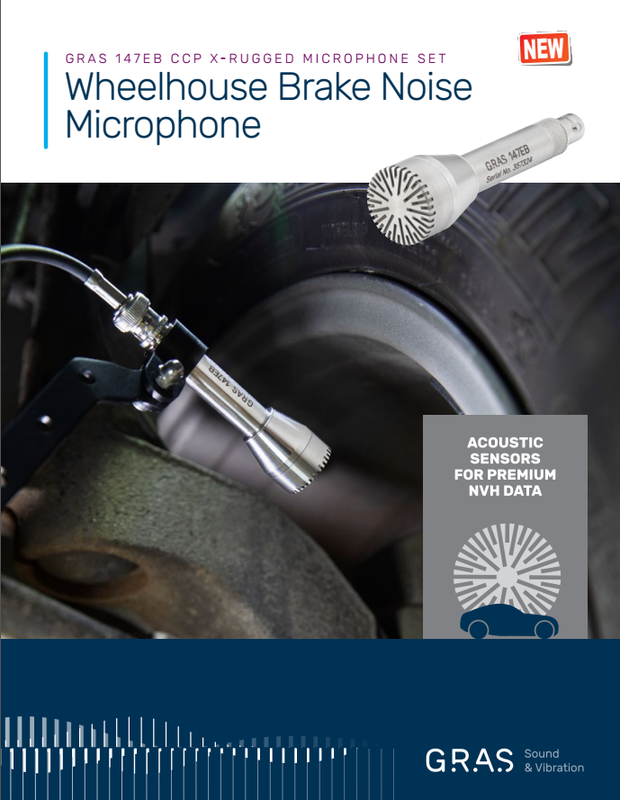 For in-vehicle brake noise measurements, GRAS 146AE ½’’ CCP Free-field Microphone Set is recommended, optionally with the RA0357 Random-incidence Corrector for 146AE. A lot of vehicle design concept selections are critical for successful reduction of unwanted airborne noise from the engine bay. Firstly, it is essential to minimize the leakage in the firewall and to optimize the acoustic insulation package. Secondly, you should make sure that the actual noise sources are as silent as possible, maybe with the help of acoustic insulation covers. To quantify all this in a measurable and comparable way, it is important to be very structured during the testing so that requirements for systems and components can be derived from the vehicle level targets. The 147AX Pressure Rugged Microphone has been specially designed to achieve repeatable measurements in positions that are hard to reach with other types of microphones. This makes it a perfect choice to place in the response positions for TPA measurements in the engine bay of a car. Its small and rugged design allows for microphone mounting in places that were otherwise impossible. Furthermore, the magnetic base of the 147AX enables easy positioning on any metal surface and the included mounting disc MagMountTM will ensure the exact same microphone position for future measurements. For engine bay measurements, we recommend GRAS 147AX CCP Rugged Pressure Microphone as it operates in the -40 to 125 °C (-40 to 257 °F) temperature range and is designed to be water and dust proof (IP67). It therefore, will survive even the most challenging engine bay environments. For in-vehicle measurements, we recommend GRAS 146AE ½” CCP Free-field Microphone Set optionally with the RA0357 Random-incidence Corrector for 146AE. Powertrain noise, vibration and harshness (NVH) testing concerns the overall driver experience of the vehicle propulsion system, and this includes everything that makes the vehicle move. The noise level and sound quality are both very important since some parts of the sound provides important feedback to the driver while other parts are just annoying. The noise from all these sources, i.e. the internal combustion engine (ICE) with air induction, exhaust system, tail pipe, gear box, belt drive system, pumps and accessories like cooling systems and fuel pump is transmitted both airborne and structure-borne into the vehicle and contribute to the vehicle acoustic comfort. The powertrain noise also aﬀects the external noise (the pass-by noise), which is regulated by legislation. GRAS provides a wide variety of standardized measurement microphones that can be used in the many diﬀerent stages of powertrain testing. We recommend GRAS 147AX CCP Rugged Pressure Microphone for engine bay measurements during powertrain tests where a low profile microphone capable of handling high temperatures is needed. To test the powertrain under diﬀerent load conditions both for far-field measurements in the dynamometer, road or drivetrain test rig and for interior measurements, we recommend GRAS 146AE ½’’ CCP Free-field Microphone Set as the best choice. When a random-incidence microphone is needed, the RA0357 Random-incidence Corrector for 146AE is recommended. Array microphones like GRAS 40PH CCP Free-field Array Microphone and GRAS 40PL CCP Free-field Array Microphone, High Pressure, are cost-eﬀective, free-field acoustic sensors for the analysis of sound fields. These types of microphones can be used in powertrain testing for measuring and locating sound sources using techniques like beamforming, near-field acoustic holography (NAH) and acoustic cameras. We recommend GRAS 40PH CCP Free-field Array Microphone and GRAS 40PL CCP Free-field Array Microphone, High Pressure, for measuring and locating sound sources using techniques like beamforming, near-field acoustic holography (NAH) and acoustic cameras. GRAS 50GI-P CCP Rugged Intensity Probe can also be used for sound intensity measurements and source location, especially useful when testing in noisy environments and for areas difficult to access with microphone arrays. For calibration, GRAS 42AG Multifunction Sound Calibrator, Class 1, and GRAS 51AB Phase Intensity Calibrator are ideal choices. The hot and dusty environment must be considered for measurement setup and equipment selection. Other important issues are exact positioning of microphones to be able to verify calibration before testing. The environmental conditions during the operational measurements are harsh with heat, dust, humidity and exhaust ﬂow. The transducers are often moved to diﬀerent positions so they must withstand handling and occasionally being dropped to the ﬂoor. It is also important to be able to position the microphones precisely and thus verify calibration before testing. The operating measurements are done with ruggedized ½” pressure or free-field microphones as per the company standards. For extremely hot positions close to e.g. the exhaust catalyst or in the direct exhaust ﬂow, use a probe microphone. Windshields are recommended both to minimize wind noise and to provide some microphone protection. For test cell measurements, we recommend GRAS 146AE ½'' CCP Free-field Microphone Set when measuring in the near-field of the muffler or measuring tail pipe noise. When temperatures exceed 125 °C (257 °F), a probe microphone like GRAS 40SC CCP Probe Microphone can be used for exhaust noise measurements, even with the microphone placed in ﬂow. For calibration GRAS 42AG Multifunction Sound Calibrator, Class 1, is the ideal choice. A sound transmission loss rig for exhaust systems typically uses four class 1 ¼” microphones. For test cell measurements, we recommend GRAS 46BD-FV ¼" CCP Pressure Standard Microphone Set, Front Vented, as a reference microphone in the sound transmission loss rig for muffler testing. The microphones for pass-by noise testing must fulfill the test procedures. Typically, a class 1, free-field microphone is used. Outdoor microphones with weather protection and internal heating are preferred for permanent installations. For outdoor measurements, we recommend GRAS 146AE ½'' CCP Free-field Microphone Set as it is IP67-rated dust and water-proof and thus withstands harsh environmental conditions. The variation in production for critical design areas must be low. The tolerance chains need to be investigated and, if necessary, compensated for with good seal systems. Intensity microphones or surface microphones are used for noise source investigations. Microphones used for wind noise testing must be very robust and able to withstand dust and humidity. For calibration, GRAS 42AP Intelligent Pistonphone, Class 0, or GRAS 42AA Pistonphone, Class 1, are ideal choices. 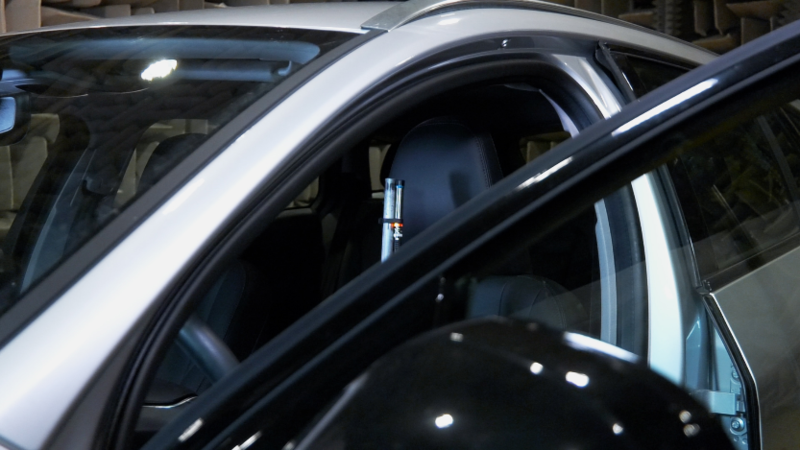 Automotive noise testing can be extremely demanding, so you need a robust solution to meet your expectations. This is why GRAS has developed the 146AE - a measurement microphone specially designed to perform under realistic test conditions. Buzz, squeak and rattle are all noises produced by parts installed in such a way that they create annoying sounds. Buzz, squeak and rattle is thus caused by the relative motion between installed parts, which make them interact, sometimes only at certain environmental conditions. Design guidelines and computer-aided engineering (CAE) methods to predict buzz, squeak and rattle in combination with production tolerances are continuously improving, but squeak and rattle problems are often detected at a very late stage, even after production start, and can be the reason for high warranty costs. Good tools are important for fast problem identification and verification of measures like adding felt tape. Improved correlation of measurements to subjective valuation is also a continuous task for the engineers. For optimum results, ½” measurement microphones should be used. The measurement in the NVH test cell with silent shaker requires low noise performance. The transducers must also withstand exposure to harsh environmental conditions such as strong vibrations, shock, drop, extreme temperatures and wet or dusty conditions. For test cell measurements, we recommend GRAS 146AE ½’’ CCP Free-field Microphone Set as this microphone is capable of measuring signals down to 18 dB(A) and thus will record even very week buzz, squeak and rattle signals originating in the silent shaker test. For in-vehicle measurements, we recommend GRAS 146AE ½’’ CCP Free-field Microphone Set, optionally with the RA0357 Random-incidence Corrector for 146AE. 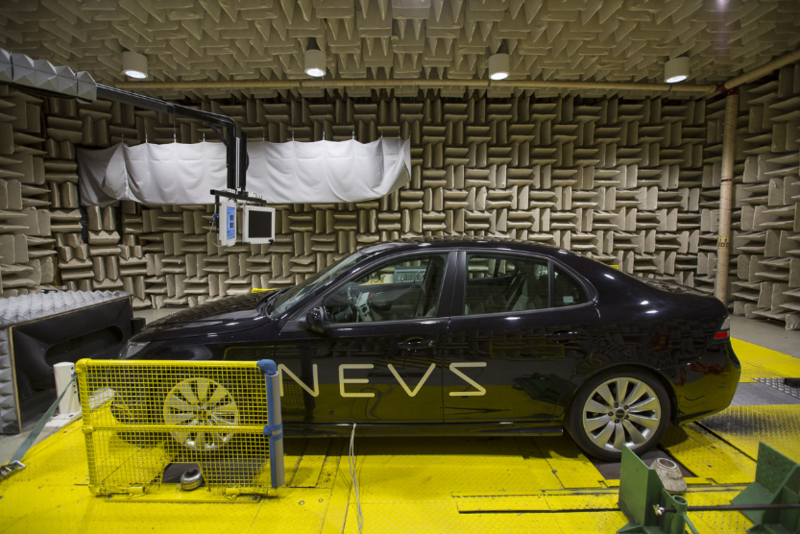 Vehicle interior noise, vibration and harshness (NVH) involves a number of diﬀerent tests – all related to noise inside the vehicle originating from road, body, chassis and components of the vehicle. A way of testing the general experience of a vehicle’s acoustic comfort. 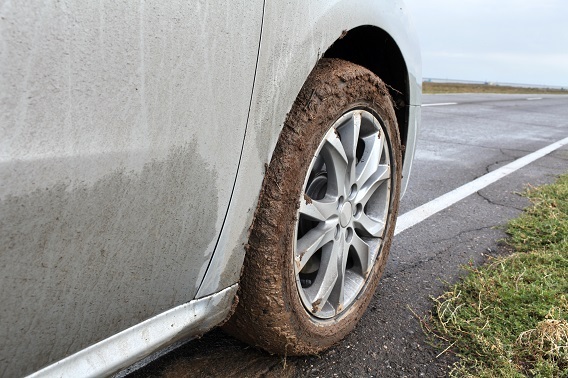 Testing related to how road excitation contributes to the interior noise both structure-borne and airborne – depending on well-defined road surfaces and tires. An area that aﬀects most of the NVH areas. Concerns all additional systems like the heating, ventilation and air conditioning (HVAC) system, power windows, etc. These are mostly electrical or driven by the engine belt, and sometimes hydraulic. A chassis-related noise and a big problem for car manufacturers. Testing time should be short since the access to prototypes is limited. Microphone positioning should be done fast and easy, and in a way to record repeatable results. The microphones should be placed so that they minimize structure-borne sound. Microphone holders and cables should not introduce any rattling noise. The installation should be safe for the test engineer to perform during vehicle testing. Calibration verification should be easy to perform. GRAS provides solutions that can be used at the diﬀerent project levels and under a wide variety of measurement conditions encountered in vehicle interior testing. We recommend GRAS 146AE ½’’ CCP Free-field Microphone Set to test the properties of the acoustic materials used in the sound package or to measure component/system noise both in an anechoic, hemi-anechoic or reverberant chamber, optionally with the RA0357 Random-incidence Corrector for 146AE. Array microphones like the 40PH and the 40PL CCP Free-field Array Microphones are cost-eﬀective, free-field acoustic sensors for the analysis of sound fields. 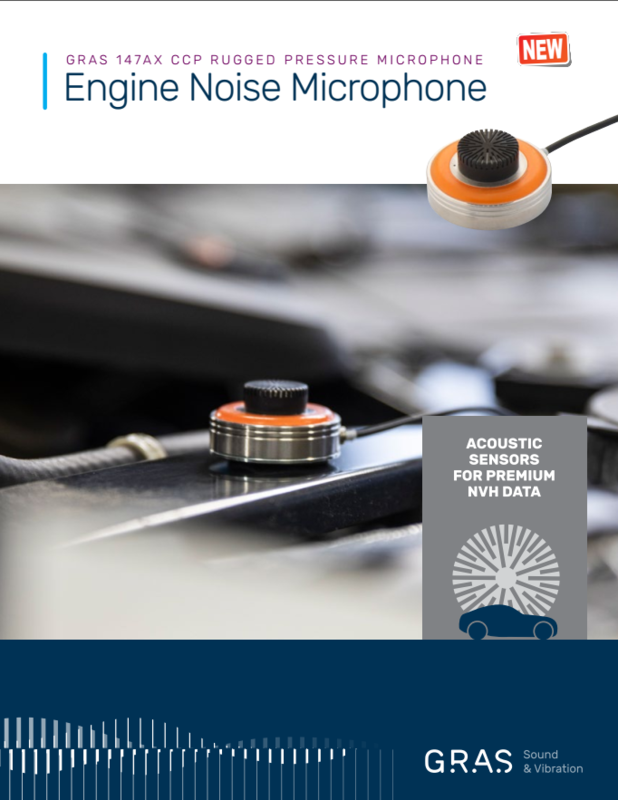 These types of microphones can be used in vehicle interior testing for measuring and locating noise sources using techniques like beamforming, near-field acoustic holography (NAH) and acoustic cameras. We recommend GRAS 40PH CCP Free-field Array Microphone and GRAS 40PL CCP Free-field Array Microphone, High Pressure. GRAS 50GI-P CCP Rugged Intensity Probe can also be used for sound intensity measurements and source location, especially useful when testing in noisy environments and for areas difficult to access with microphone arrays. For calibration, GRAS 42AG Multifunction Sound Calibrator, Class 1, and 51AB Phase Intensity Calibrator are ideal choices. Road noise is one of the most annoying interior noises in any vehicle and this problem is even more accentuated with more and more electrical vehicles on the market, leaving road noise, aero acoustic noise and, at certain conditions, heating, ventilation and air conditioning (HVAC) noise to be the dominating noise sources. External tire noise is also more and more critical for fulfilling pass-by noise regulations. Reliable equipment is critical since testing often is performed at a test track oﬀ-site. Rattle-free installation is extremely important to be able to evaluate high-frequency content that is not contributing to SPL, but to sound quality. The measurement microphone field type is important since road noise is often analyzed above 5 kHz, and time data is sometimes also used for later playback for subjective noise comparison. 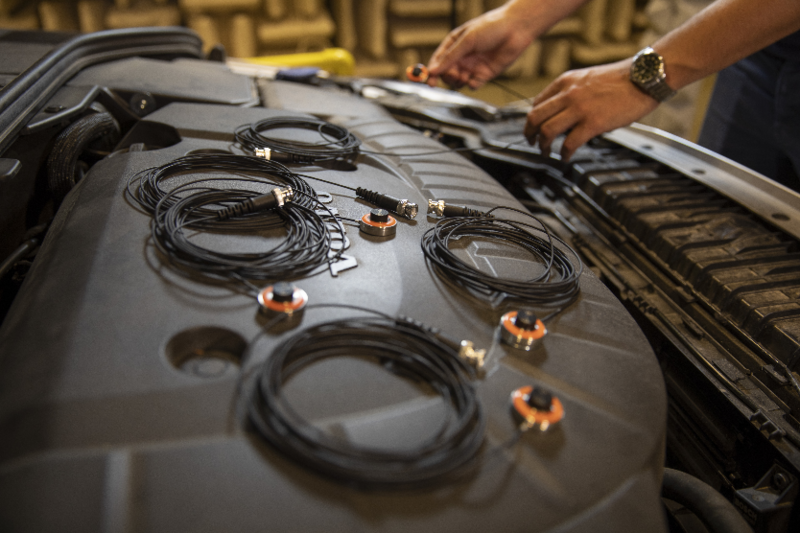 Microphones used for vehicle interior noise testing should have a frequency range up to at least 11,22 kHz to allow for the analysis to include the 10 kHz third octave band. Free-field or random-incidence ½” class 1 measurement microphones are used at ear position, and six or more microphones are used for far-field sound power measurements. The choice depends on the test procedures. Pressure or random-incidence microphones with low noise performance are recommended for acoustic transfer function (ATF) measurements where frequencies above 3-4 kHz are of importance. For in-vehicle measurements, we recommend GRAS 146AE ½” CCP Free-field Microphone Set, optionally with the RA0357 Random-incidence Corrector for 146AE. 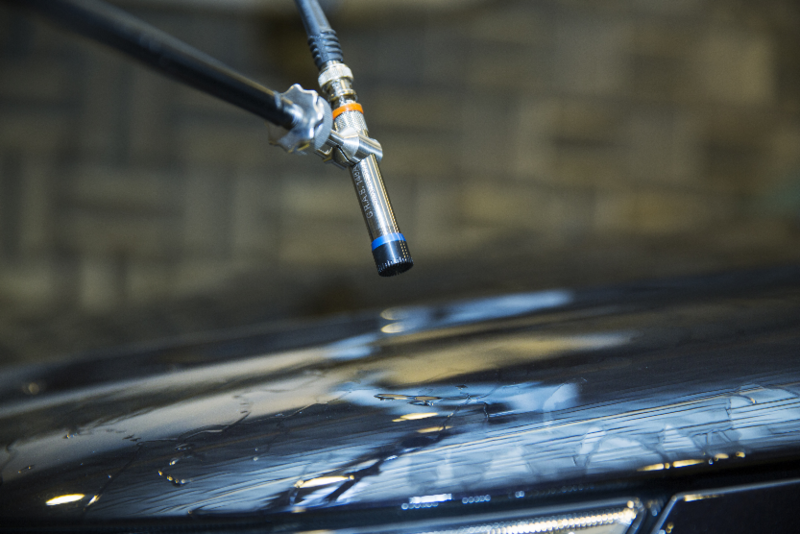 For near-field measurements or troubleshooting of the tire, intensity probes and microphone arrays can be used and configured as per the analysis equipment needs. 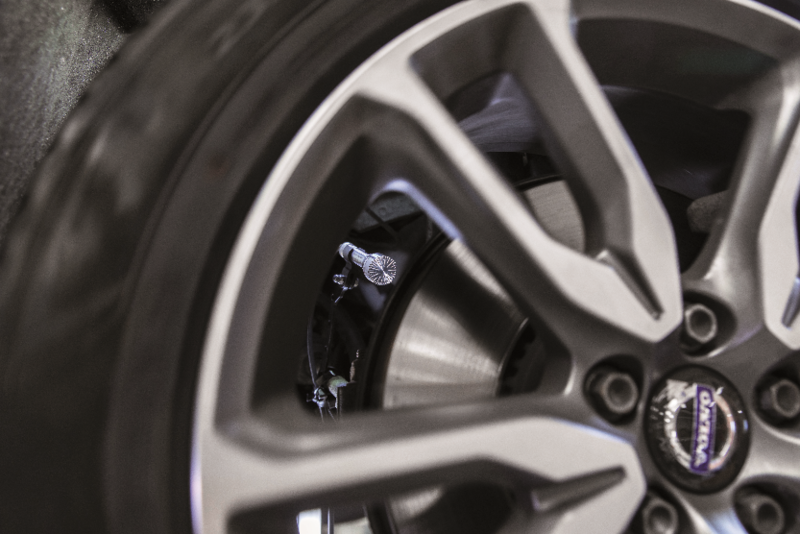 Measurements at the tire on road require nose cones or high-performance windshields. The possibility of easy verification of calibration will minimize test time and enable repeatable measurement results. The transducers are exposed to a lot of wear, often moved and even at worst case dropped to the ﬂoor. It is important to ensure that variation in environmental conditions do not inﬂuence the measurement performance. For laboratory testing, we recommend GRAS 147AX CCP Rugged Pressure Microphone. which will make ATF testing easy thanks to its small size and the possibility of mounting it even in the most difficult places and challenging environments (high and low temperature, high humidity, dust, etc.). When space or mounting challenges are not a concern, GRAS 146AE ½’’ CCP Free-field Microphone Set can be used with RA0357 Random-incidence Corrector for 146AE if random-incidence response is needed for ATF testing. GRAS 46BD 1/4" CCP Pressure Standard Microphone Set or GRAS 46AO 1/2'' CCP Pressure Standard Microphone Set can be used if pressure microphones are needed. 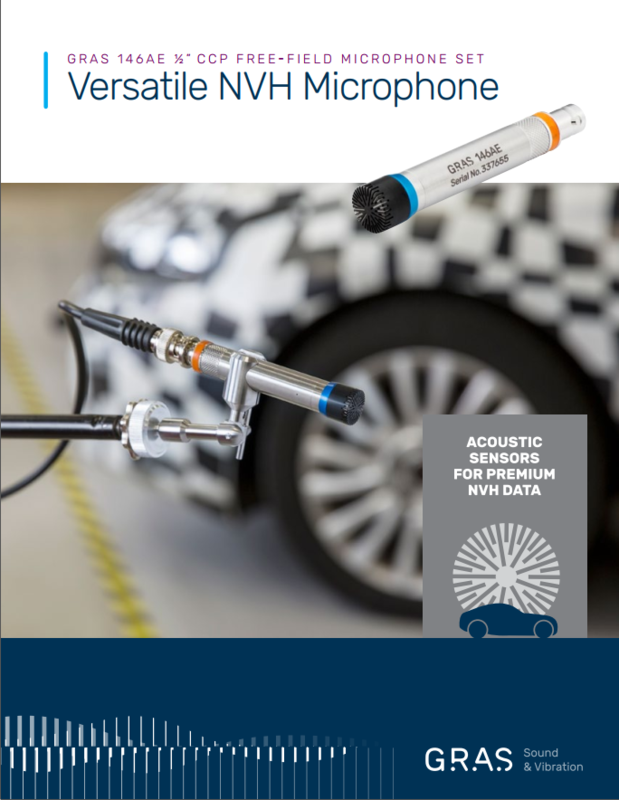 With the new rugged automotive microphone, we have elaborated our HALT test to reflect the harsh environments and conditions in NVH measurements. Strong vibrations, shock, drop, extreme temperatures and wet or dusty conditions are all par for the course for a automotive microphone. And at the end of the day you need to be confident that you have valid data, reliable repeatability and minimal downtime or re-tests. Environmental noise pollution must be minimized to ensure people’s health and comfort. Traffic noise is, therefore, regulated and without fulfilling the regional targets for pass-by noise, a vehicle model cannot get a type approval or be put on the market. 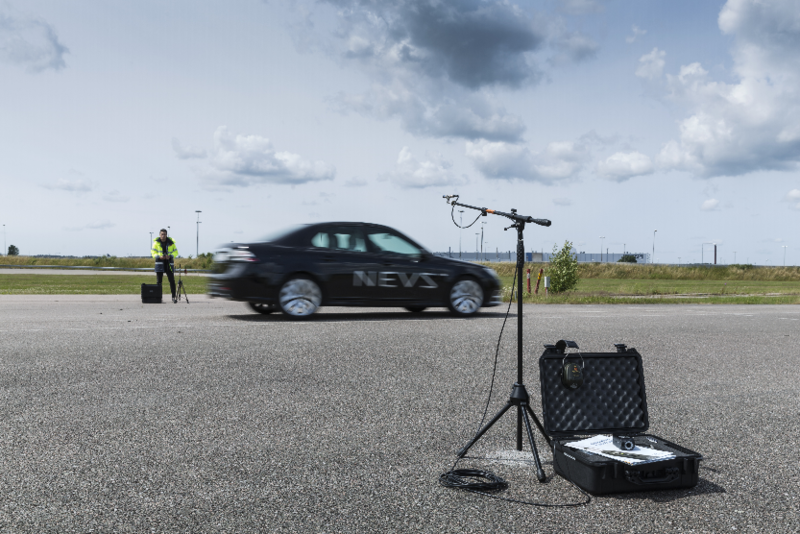 International test methods have been developed to simulate as realistic driving conditions as possible and the noise level limits have been reduced all over the world. This, obviously, puts a lot of focus on vehicle development and robustness in production. 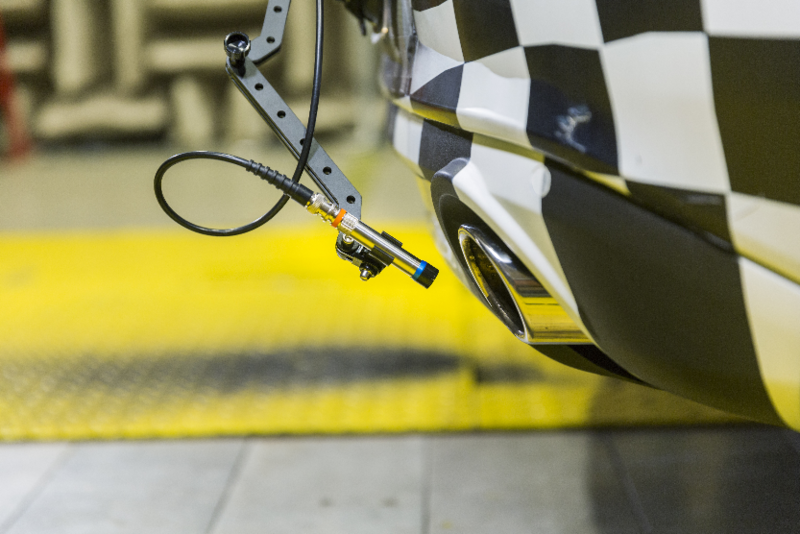 The methods for measuring pass-by noise requires dedicated facilities like specialized test tracks, large indoor noise, vibration and harshness (NVH) chassis dynamometer test cells and high-performance test equipment to produce comparable measurement results. Before running verification tests, thorough investigations of the most contributing sources (engine and intake/exhaust system, tire noise) are performed to predict the total noise level. Early tests and predictions become more and more important to be able to fulfill legislation within tightly planned vehicle development projects. Tire noise will also be more critical for future vehicles and, especially, for electrical vehicles. 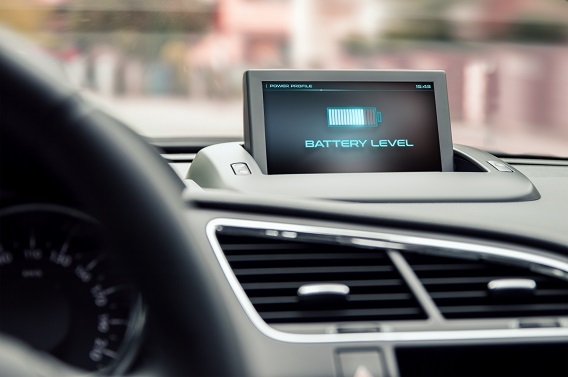 The acoustic vehicle alerting systems (AVAS) in electrical vehicles must not only fulfill target sound levels, but also sound quality design. Pass-by noise is an important part of the branding eﬀorts of vehicles and should of course also be considered. The 146AE ½” CCP Free-field Microphone Set, which is IP67 rated dust and waterproof, is the ideal microphone for pass-by noise measurements. Even when temporary rain will stop your outdoor measurements, it is not necessary to disassemble your measurement setup, if you use the 146AE, so that when the rain stops it is possible to quickly resume the measurement. We recommend GRAS 146AE ½’’ CCP Free-field Microphone Set for outdoor testing. The microphones must fulfill the test procedures, typically for a class 1, free-field microphone. Outdoor microphones with weather protection and internal heating are preferred for permanent installations. We recommend GRAS 41AC LEMO Outdoor Microphone with RemoteCheck for pass-by noise measurements in a permanent outdoor setup as this type of microphone is waterproof and can operate with very low maintenance under varying weather conditions and temperatures for very long periods of time, i.e. a year or longer. 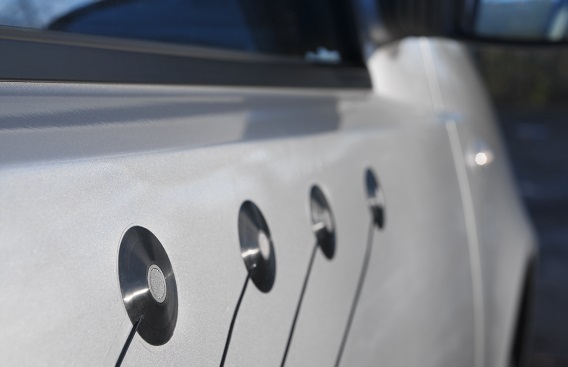 A microphone array consisting of the 146AE microphone sets can be mounted on each side of the vehicle suitable for making the pass-by driving simulation. The power-on LED indicator in the 146AE will help the test engineers to swiftly check that all the microphones are working correctly. In addition, the transducer electronic data sheet (TEDS) capabilities of these sensors will contribute to the fast setup of these multi-channel systems. We recommend GRAS 146AE ½’’ CCP Free-field Microphone Set for indoor testing. Electrical propulsion is rapidly becoming more or less mandatory to include in every OEM’s vehicle range. Many naming conventions exist for the different vehicle technologies presently available. The main categories are the battery electric vehicle (BEV) and the hybrid electric vehicle (HEV) which also includes an internal combustion engine (ICE). The main difference between traditional powertrain testing and HEV/BEV testing is this addition of one or more electric motors, including inverter technology, battery cooling and the transmission design. The electric motor means new challenges compared to the combustion engine. The main challenges are the low sound levels and tonal noise at much higher frequencies compared to traditional vehicles. The testing, therefore, requires high-quality equipment and careful measurement setup. Obviously, there is also less experience of customer reactions in this field. Microphones used for electric and hybrid driveline testing must be robust and handle any electromagnetic fields. A small size is important for easy positioning when measuring acoustic transfer functions. Free-field or random-incidence microphones are most often used, and the choice depends on the test procedures. Low-noise performance and full audible frequency range is also required. We recommend GRAS 146AE ½’’ CCP Free-field Microphone Set and GRAS 147AX CCP Rugged Pressure Microphone as both can be used to test signals down to 18 and 19 dB(A), respectively, and cover the full human audible frequency range. This means that both microphones will be able to measure the entire dynamic range of the characteristic tonal noise components from EVS. When a random-incidence microphone is needed, the 146AE can be used together with the RA0357 Random-incidence Corrector for 146AE to change its response from free-field to random-incidence (diffuse field).